Last August I wrote that Tiger Woods would not break Jack Nicklaus’s record of 18 professional major championships. He currently has 14, which is astounding, but he needs to win five more. Mike Adams wrote the other day that Woods will win a major this year–maybe even the U.S. Open–and eventually win 20 majors. In his fascinating book about his years coaching Woods, The Big Miss, Hank Haney portrays Woods as a constant tinkerer. Woods believes, and has stated as much in many interviews, that to keep from losing ground to his competitors, he must continually improve. This may be true as a basic philosophy, but not when it comes to the golf swing. The mental aspect of golf is mysterious and elusive, and the more complications one introduces, the more likely things are to go off the rails. Haney noted that because of all his tinkering, Woods has lost confidence in his driver. 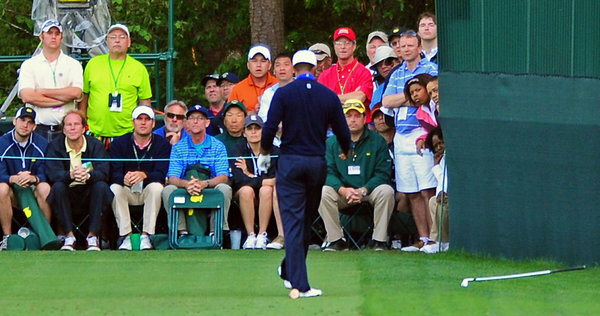 This was obvious in the recent Masters Tournament, where Woods could hardly find the fairway. Worse, he was hitting a snap hook. That’s not his normal miss, but rather a sign for him of serious swing flaws that will seriously mess with his head. It was obvious to everyone that he was coming apart at the Masters. 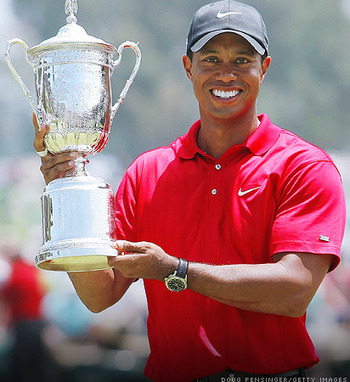 According to Adams, Woods is going to put on quite a show at the U.S. Open in June. I think he’s dead wrong. The Open this year is at The Olympic Club in San Francisco, a very difficult course that will require precise driving and mental toughness. Previous champions there (Scott Simpson and Lee Janzen) were short, accurate drivers who knew how to keep the ball in play. If Woods couldn’t hit it in the fairway at Augusta–a very forgiving course–he’s in serious trouble Olympic. Far from winning, it’ll be a surprise if Woods makes the cut. As I said before, it’ll be fascinating to watch and I do hope the best for Woods. But again, I think Jack’s record is safe. for once Tim I agree.Jack Nicklaus was an amazing golfer and won majors I believe in his 50s Tigers time is over. He won his final major (the 1986 Masters), when he was 46, which is incredible. He actually competed in a few more into his 50’s, and he did so with a repeatable swing with which he never tinkered. He always went back to basics. Tiger’s doing something pretty unprecedented and I don’t think it’s going to go well for him. Golf might be the only game in which this happens. I only play about 5 times a year, but it consistently seems like my best round is the first or second one. I then begin to unknowingly add tweaks and soon begin shanking, slicing, and grounding balls everywhere, leading to heavy frustration and the occasional thrown club. I honestly hope Tiger fine tunes some of these things and at least wins a couple more majors. But I agree with you that he’ll never catch Jack. It just seems like he’ll never be the same mentally as what he once was. Yep, golf is indeed unique in this regard. In certain sports, you can be in “the zone” in various ways, where mechanics fade into the background and you just sort of “feel” that the game slows down and “comes to you.” But in golf, once that inexpressible “thing” leaves, it’s gone and no amount of hard work and grinding it out gets it back. It’s cruel, but I think Tiger’s starting to enter that mental wilderness. It happened most recently to Nick Faldo after he won a bunch of majors in the early 90’s, culminating in his ’96 Masters win. He won the L.A. Open a year or two later, but he had already begun to lose it. He went on a sort of odyssey, consulting swing gurus and Ben Hogan (who was not kind to him at all! ), trying to figure it out. So, when he says that Tiger’s lost his mind, he knows what he’s talking about. Crazy stuff. As a child, I vaguely remember a Masters battle between Nick Faldo and Greg “the Shark” Norman. This must be the 1996 victory that was the beginning of the end for Faldo. Golf’s so unique in this regard. As a basketball player, it’s engrained in me that more repetition equals more efficient production. If I work on my jumpshot, there will be results come game time. If I work on my ballhandling, there will be more confidence in the backcourt. Yes, there can still be mental lapses amid pressure, and some have the capacity to close out games better than others (MJ compared to Lebron). But overall, if one hones his skills effectively, the fruits of this will soon be seen. It seems to work much different with golf. Surely one can work out the kinks in one’s swing, but it doesn’t seem to happen so readily. It’s much more mysterious and mentally mind-boggling, and only one who has played golf can understand this. That ’96 Masters was epic and almost unwatchable. It was so painful to watch Norman fold like that. I’ll never forget it. A good comparison to basketball would be that whole ‘closer’ debate. Spread that fear of taking the last second shot across someone’s entire 4-day tournament. Every time a guy stands over a drive in competition, with the world watching, or over a 3-foot putt that he’s got to have — those moments in a round (and there are loads!) that give you “jelly-arms” are the difference between an elite golfer shooting 68 and 75.
yeah, but what about ‘once saved always saved’? Hey, this requires a serious theology of perseverance — a works-oriented one, at that! I think you are right. Haney, in “The Big Miss,” mentioned working on developing a “driver stinger” for Tiger–a go to shot that he could count on going straight when he needed it. 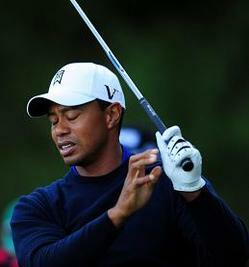 Haney said that Tiger perfected it on the range with impressive results. BUT, he didn’t have the guts to hit it in a tourny. That tells me that something seriously psychological is going on in Tiger’s head. He’s got “driver yips.” Maybe that’s Haney’s term. And his driver troubles continued today 5/3–one over par. That was one of the most fascinating things about the book–getting the inside scoop about his driver anxiety. It made perfect sense. First drive at the Masters was a snap-hook into the woods. And he never got it back on track. At Olympic in June that ain’t gonna fly!